Sheng Xiang & Band is an award-winning Taiwanese band led by guitarist and vocalist Sheng Xiang Lin, known for his work in social movements and his indie music. 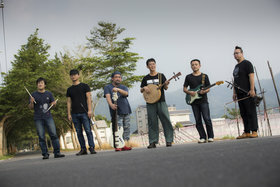 Joined by Taiwanese, Taiwanese-Hakka, and even a trio of Okinawan musicians, their music reinvents the traditional Taiwanese sound with Western influences, resulting in a unique style that conveys the taste of life in rural Taiwan. The Okinawan trio also forms Tokyo Chuo-Line, with a distinct, soulful sound developed through years of performing throughout Japan. Joined by Taiwanese-Hakka musician Misa, get ready for a whirlwind of music with her blend of punk, psychedelic rock, and jazz with the spirit of folk. TAIWANfest is back with even more live music as we raise our glass for a toast to “Kanpai, Japan!” in the beer garden, Sept. 2-4 @ Downtown Vancouver.